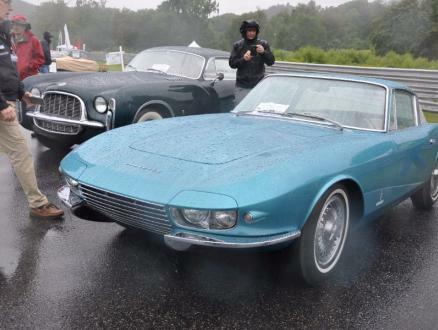 Sunday in the Park 2017 — Automotive Restorations, Inc.
Our Sunday in the Park was indeed a wet one! While this does keep the Park green and the river running, it can discourage exhibitors…but…We were all were encouraged to see some really superb machines on display for a brave group of enthusiastic umbrellaed exhibitors and spectators. 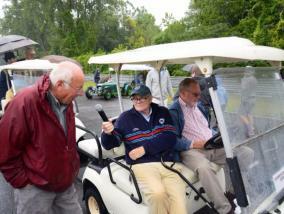 Fairfield County Concours creator Bill Scheffler (left) joined the team as Co-Chair and included Frank Taylor. Wicked weather meant lots of last minute adjustments and a whole new presentation plan. Left: Bill looks pensive and focused for good reason. It all worked; judges arrived, worked hard and stayed as dry as they could reviewing our somewhat more compact field. Event director Murray Smith, Bill and I worked the presentation out on a golf cart mobile basis (center) to good effect . Well done all! Elizabeth and Andy brought their newly acquired ‘58 Ford Ranchero with a matching Kurtis Craft Midget in tow. A perfect Sunday in the Park, speed with vintage style exhibit if ever there was. Honored Collector Bruce Meyer agreed, giving them his award choice among a fine field. Elizabeth Jensen (left) certainly did not let the weather get her spirits down . She gave courage to all!! Never a man to let a few drops stop him, Henry Miller had his superb Mercedes-Benz 300SL Gullwing coupe exhibited to good effect. Honored motorcycle collector Phillip Richter’s selection from the full field was Henry’s Mercedes. A special award appreciated & well presented. Overcoming gloom in style found Co-Chair Bill Scheffler with Spitfire racer Dave Gussack & Teo popping a cork and sipping champagne while accepting the award for: 1st in class; Life at the Top in Style and Comfort, Luxurious Transportation, Coupes or Salons 1945 – 85. The car? 1960 Cadillac 75 Series limousine, what else?? This Dennis Nicotra entered, here represented by ARI’s own Craig Cronin, 1929 Alfa Romeo 6C 1750 SS garnered the 1st place award for Gatsby’s Delights. Luxury and speed in coach-built cars for an elegant era (pre WWII). 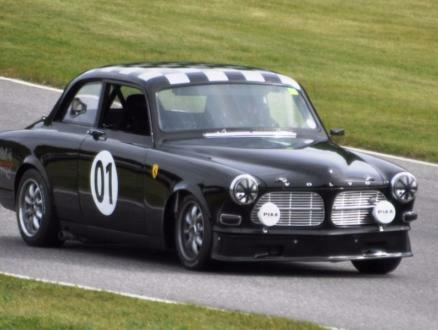 He’s awarded 1st in class D1, Style, Comfort and Pace for GT cars to 1961. The very tidy and original Lotus Elite just next door found a Lime Rock Select award this day! Gathering of the Marques is Sunday’s “come as you are” event and was surprising well attended for a day of subpar weather quality. Awards were appreciated and exhibitors all very much appreciated for making the best of it!! 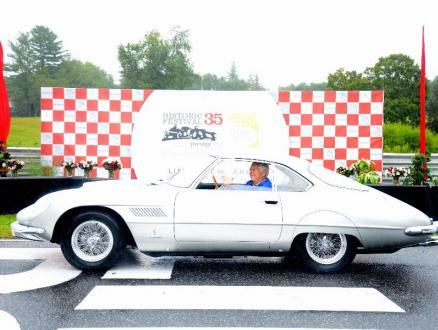 Scuderia N.E.’s 1961 Ferrari 250GT Speciale Competition garnered a well deserved Best of Show and did drive up to a slightly soggy presentation area. Thanks for a truly great car & sticking with it!! Who says Ferraris don’t go out in the rain? 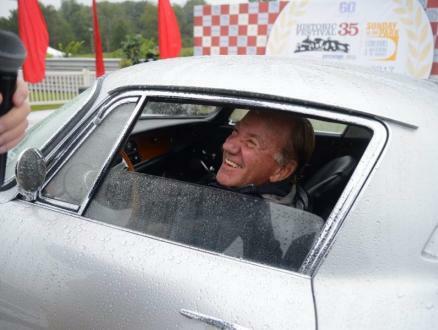 Bob Wilder and his 6 carb 1966 Ferrari 275GTB long nose garnered a well deserved People’s Choice Award. Thanks to all you Ferrari guys who drove between the drops! As this all proves, Hurricane Harvey did not get the better of us. Thanks to all!! 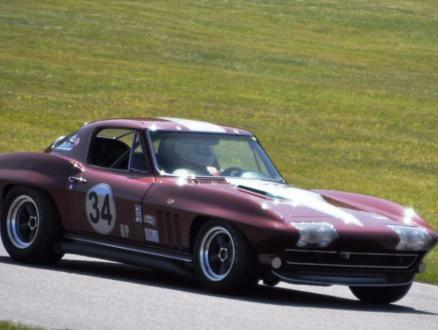 Historic Festival 35, a Celebration of Speed, Style and Lime Rock Park’s 60th year. The VRS Paddock comes to life amid perfect temps and clear skies…but Hurricane Harvey had a plan for Sunday…. Read on to Sunday in the Park. A Royale RP 4 contest of speed as VRS racer Richard Kresch and his 1970 Royale-Lotus RP4 motor by John Greller as the Royale pair approach turn 1 in Monday’s group 3 race. Richard finished a tidy 8th overall, a scant 44 seconds behind the winner. Good Job Richard!! 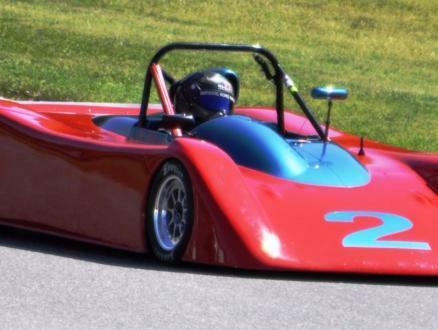 The VRS paddock fielded two Sports 2000 entries for Historic Festival 35. Top is Bob Mittman in his Carbir S2000 and right is Jim Montana into the left hander at speed in his trusty Swift. Not a wheel was put wrong all weekend for both the S2 guys with Bob 6th OA on Saturday and Jim 9th in Monday’s group 8 feature race. 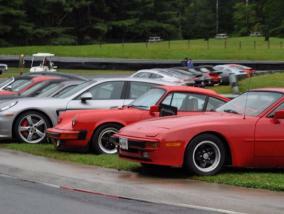 Historic Festival 35 was not the weekend for VRS 914 Porsche power. The field found them powerfully outclassed in group 5 and tuning was tough. Ed and his almost always reliable 914-4 above had a series of problems that kept us busy. Tom Brown’s VRS rental 914-6 had its moments; Tom gets by a slightly errant Jag, but really did not have all this car’s “oats” until Monday’s race. A rare opportunity and an even rarer car. Left, Tom Brown leads Lee Holman’s Ford GT 40 Spyder into the esses while right, VRS’s own Brian Rechtiene does a superb job piloting the VRS Volvo 122S Amazon to a 6th overall in the almost always entertaining Historic Festival 35 rendition of the Group 3 “Tin Tops” vintage sedan challenge. VRS prepared & service assisted Spitfires were out in force. Left: Dave Gussack leads Richard Attwood and the Revs Institute GT-40 past Kevin Gosselin’s Triumph Spitfire 1300 while Tom Brown in the VRS rental Spit tags along behind Attwood for the ride. Left…. More VRS Spitfire action: Kent leads Dave out of turn one in a ”Spitfires to the fore” closely contested qualifying session. Dave soon found the way around and a pole position for the next session!! Great LRP racing and good fun for all! RESULTS – they do speak for themselves: Adding only that we all enjoyed a well run event. Great racing weather, good sportsmanship, speed and style without undue drama and lots of fun for all! !